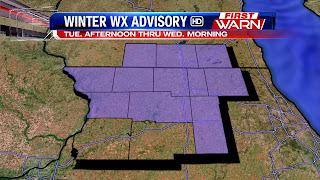 Winter Weather Advisories in effect for the entire Stateline and for the surrounding major cities of Madison, Milwaukee and Chicago. 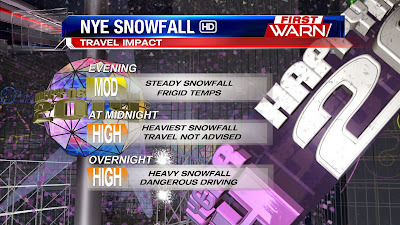 So wherever your plans take you this evening, you'll be impacted by this snow storm. Higher snowfall totals are expected to our south and east including Rochelle and DeKalb which can receive up to 6" by Wednesday morning. This is the most significant snow event for those areas which have gotten by without receiving much snow thus far this season. Do you have plans to go out for New Year's Eve? Then listen up, because this is going to affect you in a big way. A significant snow maker is expected to roll through the Stateline starting Tuesday afternoon and continuing through New Year's Day. The biggest concern here is the timing. With some of the heaviest snow expected to fall the same time as the ball drops to ring in 2014, travel will be highly impacted. 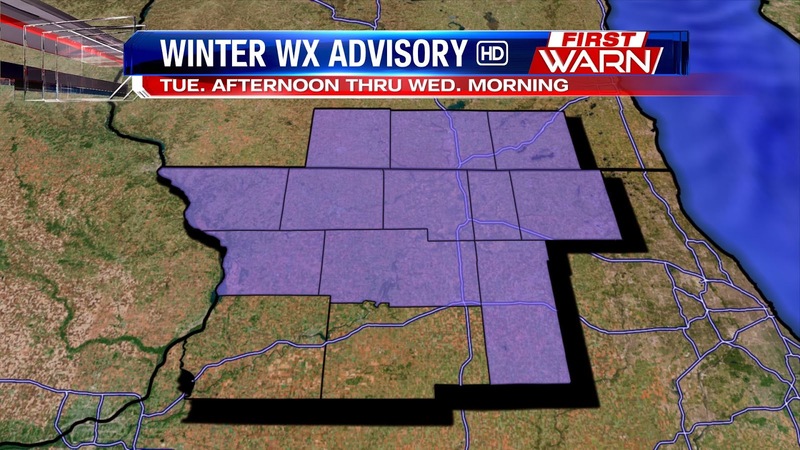 Because of this, a Winter Weather Advisory has been issued for most of the Stateline starting Tuesday afternoon and running through New Year's morning. Taking a look at our Futurecast model, several inches of snow will have already fallen when midnight strikes on New Year's Eve. Right now, it looks like 4-6" of total snow will be possible through New Year's Day. Hopefully you didn't get used to that mild air around the Stateline because temps will be falling fast as we head into Sunday. Saturday's high of 42° was the warmest we've seen in over 3 weeks since a 52° temperature reading recorded back on December 4th in Rockford. A cold front digging through the upper Midwest will bring some light snow showers Sunday morning ending around lunchtime and will leave a dusting to a half inch of new snowfall on the ground. While the Stateline is poised for a big warm-up on Saturday, that warm-up could have been even bigger if it weren't for all this pesky snow. Taking a look at Friday's snow cover map, you'll notice the viewing area is on the southern edge of where snow is still on the ground. When you translate this over to temperatures, you'll notice a big cooldown in areas with that snow cover. The warm front over Northern Illinois this morning not only brought fog, but mild temperatures! Winds out of the southwest are bringing in that warmer, drier air mass for our area. 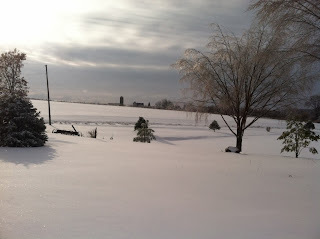 Above freezing temperatures are a welcome change of pace for the Stateline. 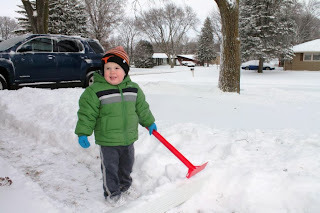 We'll be in the mid 30's Friday afternoon and close to 40° on Saturday. 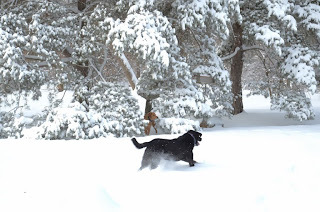 Enjoy it while it lasts though because we are not through with the Arctic blasts. 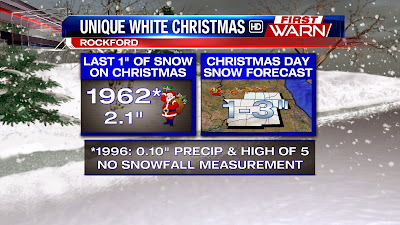 While a White Christmas isn't uncommon for the Stateline, getting snow on Christmas is a much different story. 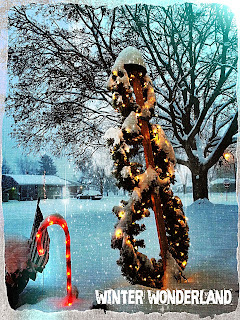 The forecast is calling for 1-3" of snow between Christmas Eve night and Christmas morning. 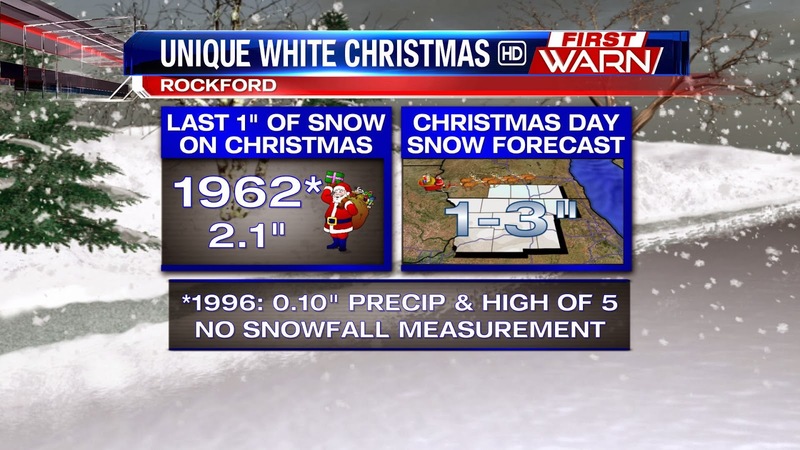 If this holds, it will be the first Christmas for Rockford where we get at least an inch of snow in more than 50 years! Snow is moving into the area tonight, so as we track Santa's travels around the world, the big question is will it affect his stop in the Stateline. Of course not! This is Santa we're talking about. 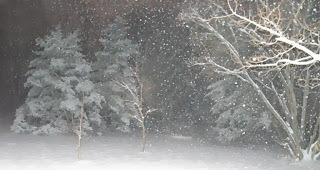 Snow will begin on Christmas Eve (around 7:00 or 8:00pm) and be at its heaviest during the overnight. 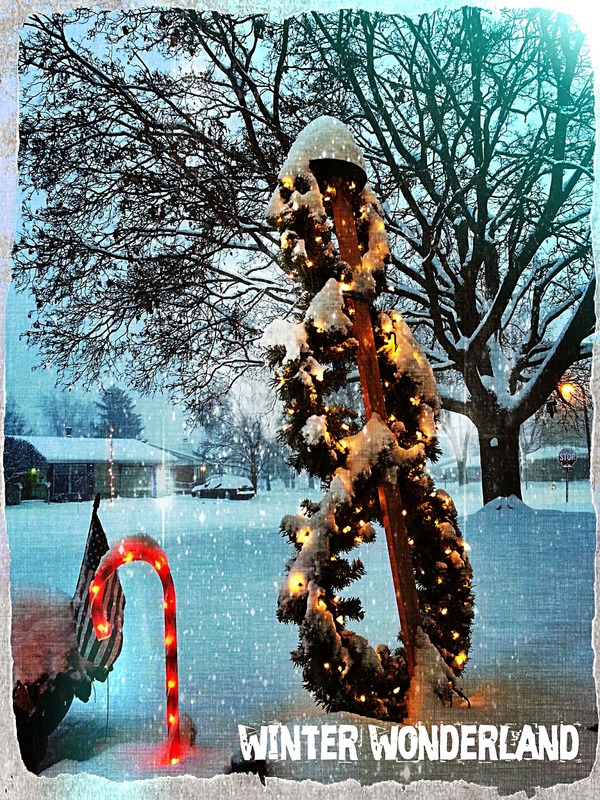 Accumulating snow should start wrapping up by Christmas morning, with 1-3" possible for the viewing area. 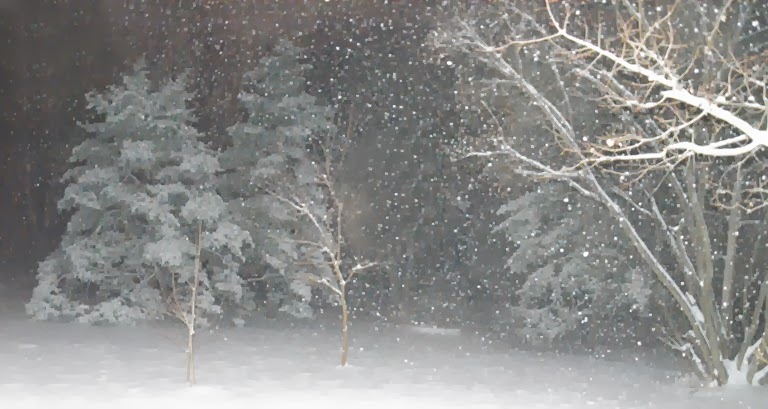 After this past weekend's snow there was no question that we would experience a white Christmas, but the fact that the snowflakes will be flying on Christmas morning could make it that more special for some people. A quick moving storm system will bring light, accumulating snowfall to Wisconsin and Northern Illinois late Tuesday night through mid Wednesday. The snowfall won't be much and shouldn't affect travel plans you may have, but expect 1" to 2" of snow by Wednesday afternoon. Clearing skies tonight will allow the temperatures to drop below zero by Tuesday morning. The cold air mass over a fresh snow pack means that even with a little breeze, wind chills could drop as low as -20° in some locations! 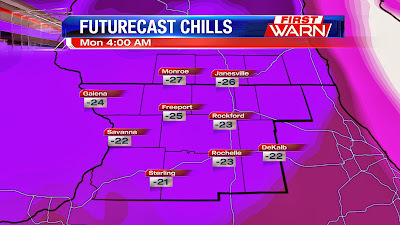 In anticipation of the chill, a Wind Chill Advisory has been issued for our western counties: Jo Daviess, Stephenson, Carroll and Whiteside through Noon Tuesday. 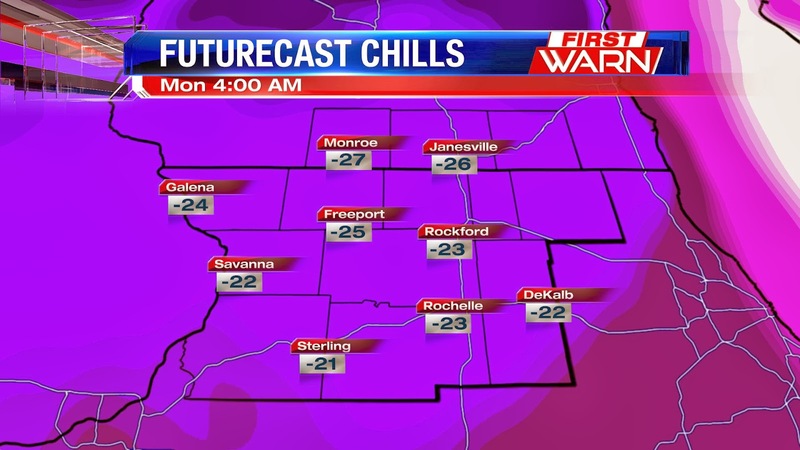 Wind chills will remain below zero through Tuesday morning and only warm slightly above 0° during the afternoon. 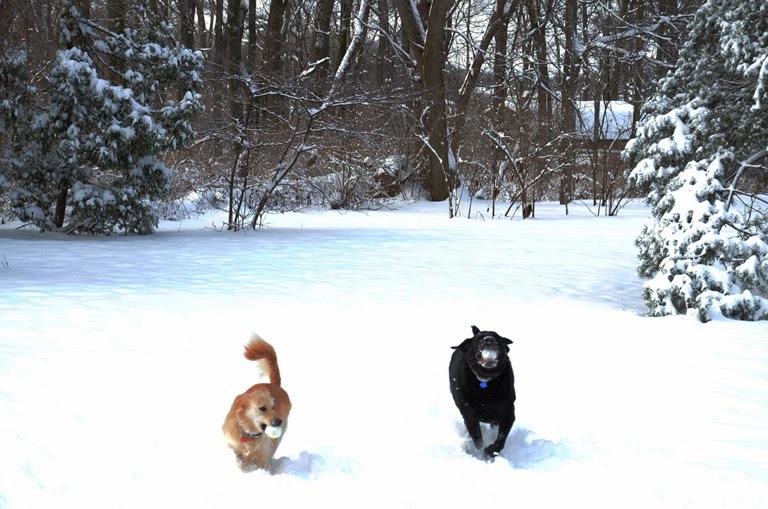 Another dip in temperatures is expected Thursday and Friday. 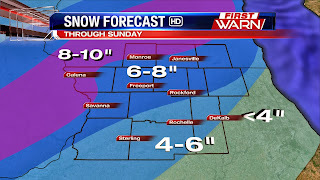 Last week, the First Warn Weather team anticipated the largest snowfall of the season to impact the Stateline Sunday morning. 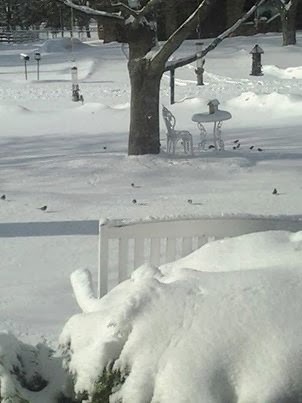 I noticed that many viewers on social media were upset that all the local meteorologists had slightly different snowfall amounts forecasted. Most local TV station weathercasters around the Stateline have accredited meteorology degrees from different schools around the country. With those different backgrounds, each individual meteorologist has and will continue to have differing opinions when looking at the vast amount of computer model forecasts and deciding which ones are most believable. They will also use prior forecasting knowledge and experience to give what they believe to be the most accurate and dependable forecast. 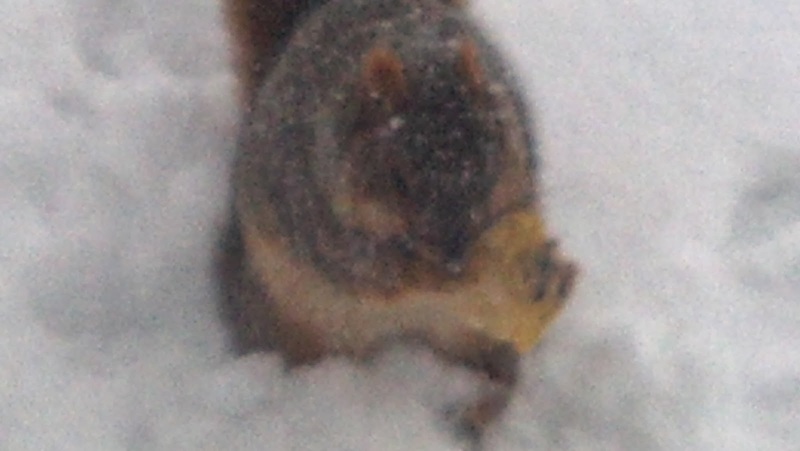 I'd like to share with you how my specific forecast panned out. The two images above compare what I forecasted Saturday afternoon for Saturday night and Sunday morning's snow storm versus actual snow totals. 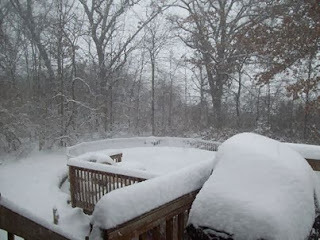 The placement of the snow was fairly accurate: far southeastern counties in Northern Illinois received minimal snowfall. 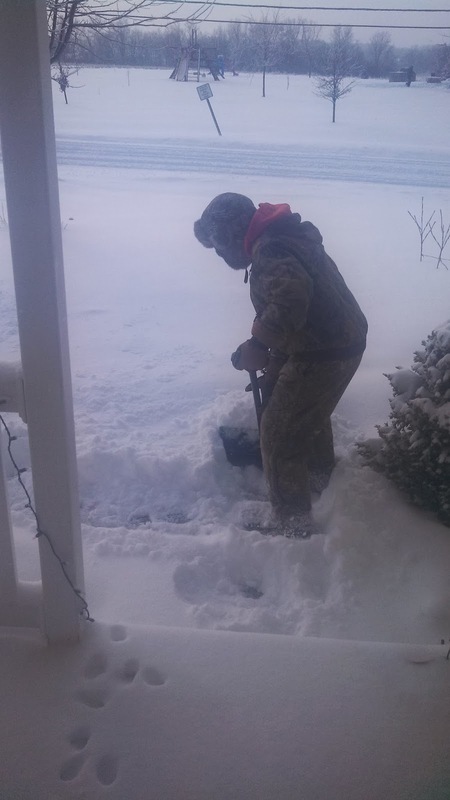 Northwestern counties, including much of southern Wisconsin, saw the most snow. 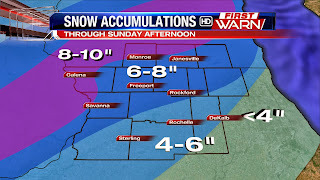 The amounts were also fairly accurate though I overestimated higher end amounts for our extreme northwestern counties. As I go into future forecasting situations I will now have a better understanding of how different computer models did or did not handle this snow event on a large and small scale along with my own personal biases of what I perceived would happen. 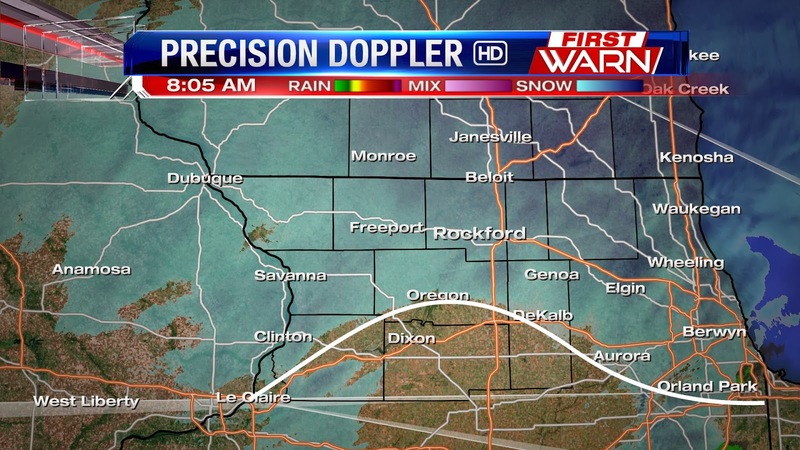 9:42am Update: The snows have ended except in extreme northern Rock and Walworth Counties in Wisconsin. As we head into the afternoon, we may see spotty light showers, but the heaviest snow has ended for the most part. 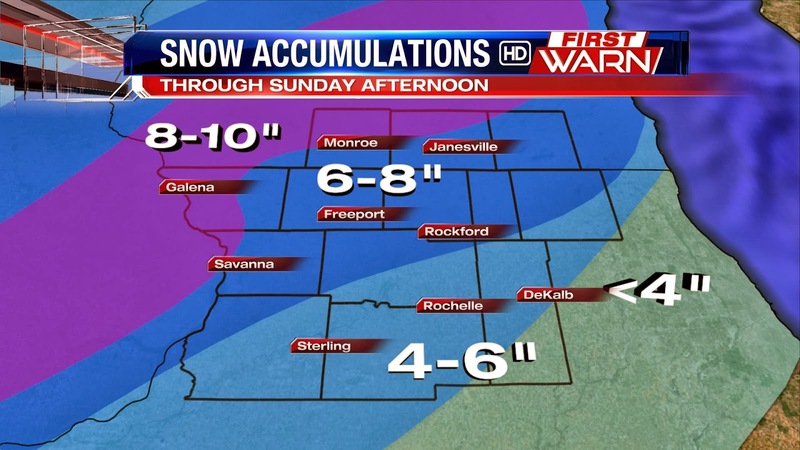 Snowfall totals range anywhere from 4 to 7 inches around the Stateline. The main concern will continue to be road conditions as we head into the afternoon and evening so we'll keep a High Weatherisk through then. (9:45:31 AM) nwsbot: Local Storm Report by NWS DVN: 2 NNW Thomson [Carroll Co, IL] trained spotter reports SNOW of M5.3 INCH at 09:40 AM CST -- storm total. (9:44:11 AM) nwsbot: Local Storm Report by NWS DVN: Sterling [Whiteside Co, IL] trained spotter reports SNOW of M4.0 INCH at 09:21 AM CST -- total. via espotter. 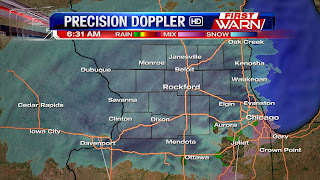 (9:40:45 AM) nwsbot: Local Storm Report by NWS DVN: WSW Stockton [Jo Daviess Co, IL] trained spotter reports SNOW of M4.5 INCH at 09:30 AM CST -- snowing very lightly. 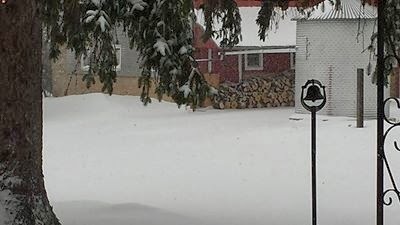 (9:35:44 AM) nwsbot: Local Storm Report by NWS DVN: Erie [Whiteside Co, IL] trained spotter reports SNOW of M4.4 INCH at 09:31 AM CST -- total. via espotter. 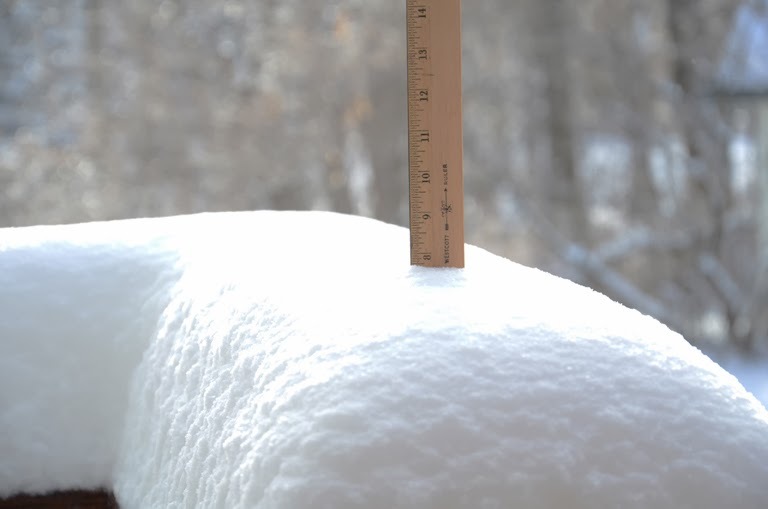 (8:50:31 AM) nwsbot: Local Storm Report by NWS DVN: 6 SSE Council Hill [Jo Daviess Co, IL] trained spotter reports SNOW of M5.0 INCH at 08:30 AM CST -- storm total. currently not snowing. 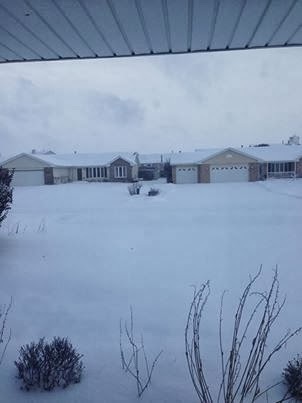 (8:38:24 AM) nwsbot: Local Storm Report by NWS DVN: 4 SSE Winslow [Stephenson Co, IL] trained spotter reports SNOW of M5.5 INCH at 08:30 AM CST -- still snowing lightly. (8:33:48 AM) nwsbot: Local Storm Report by NWS DVN: 1 N Freeport [Stephenson Co, IL] trained spotter reports SNOW of M5.0 INCH at 08:00 AM CST -- still snowing. (8:29:55 AM) nwsbot: Local Storm Report by NWS DVN: Lena [Stephenson Co, IL] trained spotter reports SNOW of M4.0 INCH at 08:23 AM CST -- total. 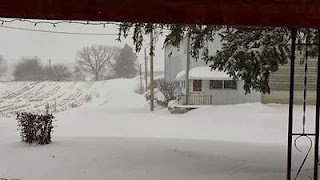 (8:29:55 AM) nwsbot: Local Storm Report by NWS DVN: 6 WSW Schapville [Jo Daviess Co, IL] trained spotter reports HEAVY SNOW of M6.2 INCH at 08:26 AM CST -- still snowing lightly. (7:45:02 AM) nwsbot: Local Storm Report by NWS DVN: Galena [Jo Daviess Co, IL] co-op observer reports SNOW of M5.0 INCH at 07:35 AM CST -- still snowing. snow depth 7 inches. 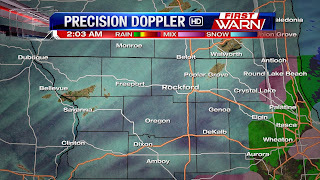 (7:45:01 AM) nwsbot: Local Storm Report by NWS DVN: Freeport [Stephenson Co, IL] co-op observer reports SNOW of M5.4 INCH at 07:30 AM CST -- 24hr total sor far. 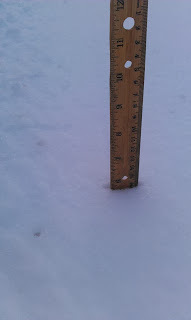 snow depth is 6 inches. 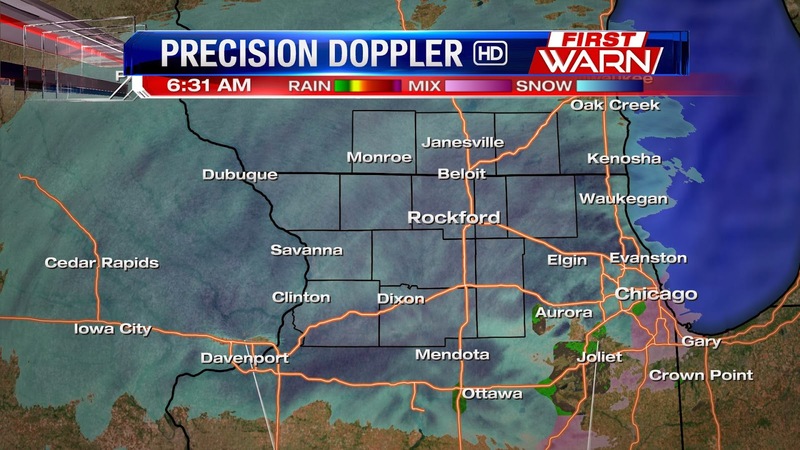 6:35 am Update: The moderate to heavy snow continues to fall across the Stateline early this Sunday morning. Visibility remains at one mile or less and will continue to remain low until the snow begins to end which will be mid-morning. 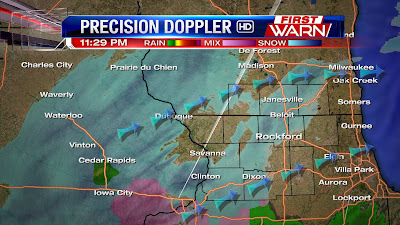 Winter Storm Warnings continue through 10am for Winnebago, Ogle, Lee, DeKalb, Boone and McHenry counties and until 6pm for Stephenson, Jo Daviess, Carroll, Whiteside, Green, Rock and Walworth counties. 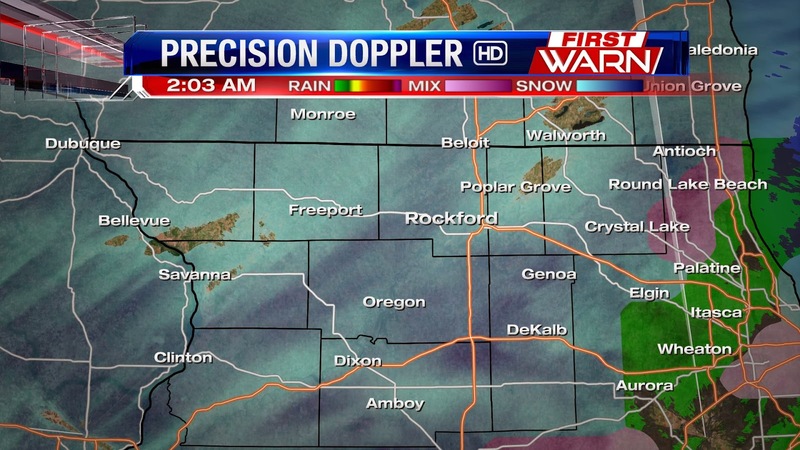 2:05am Update: A few pockets of heavier snow are present around Winnebago southwest towards Forreston and Mt. Morris as well as near Creston and Malta. 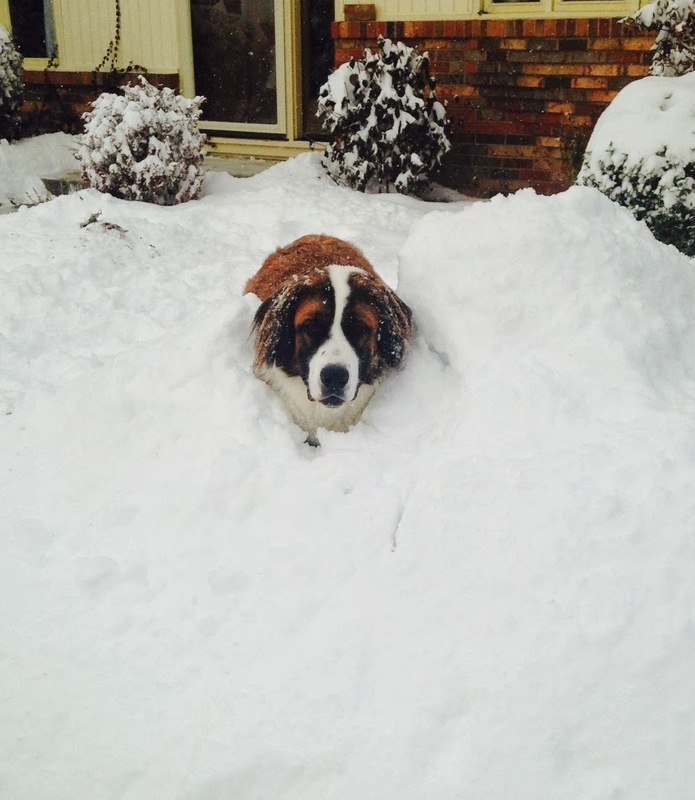 Snow will continue into the overnight through mid-morning Sunday. 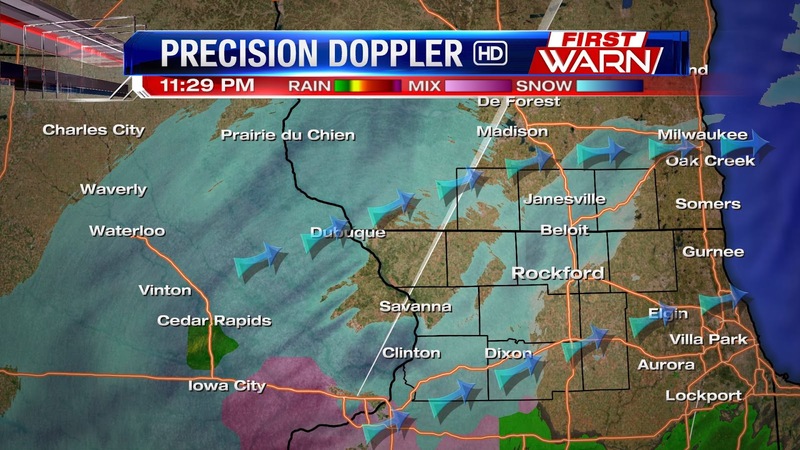 Just before 11:30pm, heavy snow approaches the Mississippi River and our western counties. Winter storm warnings are in effect til 10am Sunday morning in anticipation for widespread heavy, wet snow. 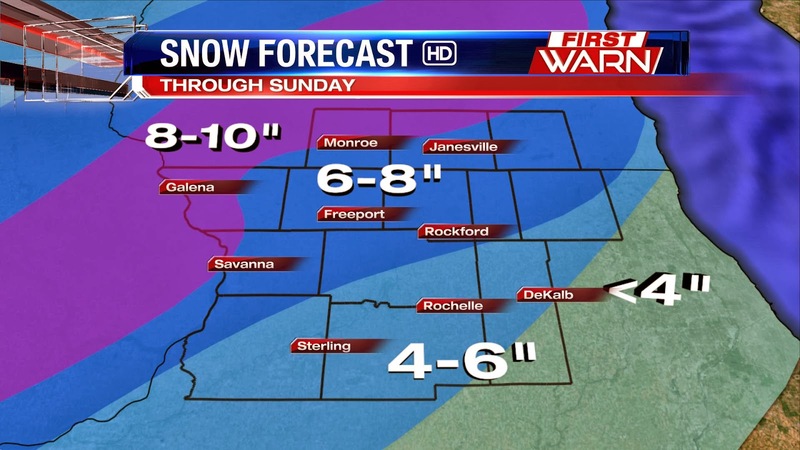 Depending where you're at in the Stateline you can get anywhere from 4-10" of snow. Many churches have already cancelled services due to the timing of the heaviest snow. For a full listing to see if your church is closing its doors, head over to http://www.mystateline.com. Early Week Snow: Deja Vu? Why Were We So Foggy? How Do We Get Rid Of This Fog? !